Sculpture in Cork's No 1 Art Museum - By Sculptors like Joseph Higgins, Seamus Murphy, Oliver Sheppard. 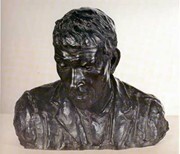 In addition to Irish sculpture and painting, prints and sculpture, the Crawford Art Gallery's Permanent Collection includes a number of artworks in other media. These include stained glass art by Harry Clarke (The Eve of St Agnes, 1924); Maud Cotter; James Scanlon (Le Coeur parle au Coeur, 1995); photo montages by Willie Doherty (Evergreen Memories, 1988), and Alanna O'Kelly (Country Blooms, a Garden and a Grave, 1990); and contemporary installation art video from Dorothy Cross.  For more about arts venues in Ireland, like the Crawford, see: Irish Art Guide.